This article is about the 1992–2011 retail model car. For the version used by law enforcement, see Ford Crown Victoria Police Interceptor. For the 1979–1991 model, see Ford LTD Crown Victoria. The Ford Crown Victoria (colloquially called the "Crown Vic") is a full-size sedan that was marketed and manufactured by Ford from the 1992 to the 2011 model years. The successor to the Ford LTD Crown Victoria, the Ford Crown Victoria served as the flagship sedan of the Ford model line, slotted above the Ford Taurus and as the Ford counterpart of the Mercury Grand Marquis. Produced across two generations, the Crown Victoria was sold exclusively as a four-door sedan. Ford marketed the purpose-built Ford Crown Victoria Police Interceptor police car variant to law-enforcement agencies; a long-wheelbase sedan for commercial (taxi) use was introduced in 2002. The Ford Crown Victoria was produced on the rear-wheel drive Ford Panther platform, shared with the Grand Marquis and Lincoln Town Car. From 1997 until their 2011 withdrawal, the three sedans were the final full-frame rear-wheel-drive passenger sedans produced in North America and the only non-luxury sedans offered with a standard V8 engine. The Ford Crown Victoria (and Crown Victoria Police Interceptor) were produced at the now-closed St. Thomas Assembly in Southwold, Ontario, Canada. 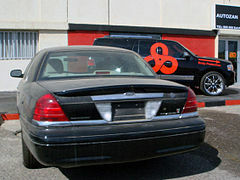 The final vehicle produced at the facility was a 2012 Crown Victoria, as part of a small group of vehicles intended for export to the Middle East. In total, over 1.5 million examples of the Ford Crown Victoria (including Police Interceptors) were manufactured by St. Thomas Assembly from 1991 to 2011. Within the Ford model line, the Crown Victoria was not directly replaced, with the front/all-wheel drive Ford Taurus most closely matching it in interior and trunk dimensions. Prior to its use as the Ford Crown Victoria, Ford has used the Crown Victoria nameplate (in other forms) twice before. From 1955 to 1956, it was used to denote the flagship model of the Ford Fairlane model range. From 1980 to 1991, the nameplate was used in a similar fashion, denoting the premium trim of the Ford LTD; from 1983 to 1991, the nameplate was expanded across all full-size LTD sedans in North America. 1955 marked the first use of the Crown Victoria nameplate by Ford. To introduce its premium Ford Fairlane model range, the Fairlane Crown Victoria was introduced as its flagship model, replacing the hardtop roofline of the Victoria hardtop coupe (an additional nameplate revived for 1955) with a B-pillared roofline distinguished by a wide stainless-steel band "crowning" the roof. While the large B-pillar pre-empted a hardtop roofline, the design allowed for a sleeker appearance. The Crown Victoria Skyliner was a variant of the Crown Victoria with a fixed acrylic glass sunroof forward of the stainless-steel B-pillar. For the 1956 model year, along with the rest of the Ford model line, the Fairlane Crown Victoria was offered with the Lifeguard option package as an option. As the Ford model line was redesigned for 1957, the Ford Fairlane Crown Victoria was withdrawn with no replacement. The Skyliner name returned to the Fairlane range, denoting the Ford Fairlane 500 Skyliner retractable hardtop convertible. For the 1980 model year, the Crown Victoria nameplate was revived after a 23-year hiatus, becoming part of the Ford LTD model range. A year after the downsizing of the full-size Ford model lines, the LTD Crown Victoria replaced the LTD Landau (1975-1979). To distinguish itself from its Mercury (Grand) Marquis counterpart, the LTD Crown Victoria adopted a styling element of its 1950s predecessor. The vinyl roof was fitted with a stainless-steel band to trim the B-pillars (with the standard vinyl roof not extending past the B-pillar). Sold as a two-door and four-door sedan, the LTD Crown Victoria shared its interior trim with the LTD Country Squire station wagon. For 1983, as part of an extensive revision of the midsize and full-size model lines of all three Ford divisions, the LTD Crown Victoria became a stand-alone model line (alongside its Mercury Grand Marquis counterpart); the Ford LTD nameplate was shifted to the mid-size segment, replacing the Ford Granada. The 1991 discontinuation of the LTD Crown Victoria (and LTD Country Squire station wagon) marked the final usage of the Ford LTD nameplate in North America. Ford of Australia would continue usage of the nameplate (as a higher-trim version of the Ford Fairlane) through the 2007 model year. In the first quarter of 1987, development began on a redesign codenamed "EN53". The Ford Crown Victoria was unveiled on November 28, 1990 and began production in January 1991 as a 1992 model, launching on March 21, 1991. In an effort to optimize its availability for buyers, at the launch, fleet sales of the vehicle were postponed for 14 months. The long-running LTD prefix was dropped to better distinguish the generation for buyers. In line with the redesign of the 1991 Chevrolet Caprice (its chief competitor), the 1992 Crown Victoria featured a major exterior redesign on the previous-generation chassis. Focused on aerodynamics and fuel efficiency, Ford reduced the coefficient of drag of the exterior from 0.42 to 0.34 (nearly matching the 0.32 of the Ford Taurus). Due to a market shift in family-oriented vehicles, the Crown Victoria was offered exclusively as a four-door sedan, with the wood-trim LTD Country Squire station wagon discontinued. While the Ford Taurus and Mercury Sable continued in production with optional three-row seating, the role of the Country Squire was effectively superseded by the Ford Aerostar and Ford Econoline/Ford Club Wagon vans, and the Ford Explorer SUVs. 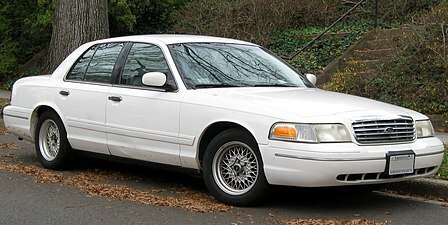 During their launch, the Ford Crown Victoria (and Mercury Grand Marquis) were involved in a unique loophole involving CAFE. Though produced in Southwold, Ontario (which otherwise made them domestic automobiles), to avoid gas-guzzler taxes, Ford modified its supplier network in order for the two vehicles to be classified as imported vehicles, effectively removing the full-size sedans from the Ford domestic CAFE fleet (alongside the Ford Mustang V8) and placing them in its imported fleet (alongside the Ford Festiva). Showcased in the redesign was the new Modular V8 engine. First introduced in the 1991 Lincoln Town Car, the 4.6 L SOHC V8 replaced the overhead-valve 5.0 L (302 CID) Windsor V8 and was the first of a family of overhead-cam engines that would eventually appear in a number of Ford and Lincoln-Mercury cars and trucks. Lighter than its predecessor, the 4.6 produced nearly identical torque output while producing 40 additional horsepower in its standard single-exhaust configuration. As with its predecessor and the Lincoln Town Car, the 4.6 was paired with a 4-speed overdrive automatic transmission. In 1993, the Ford AOD transmission was replaced by the electronically-controlled AOD-E version. For 1995, the AOD-E was replaced by the 4R70W, a heavier-duty version introduced in the Lincoln Mark VIII. Ford based much of the Crown Victoria's appearance on the first-generation Ford Taurus, a look pioneered by Ford VP of Design Jack Telnack. Though the Taurus became wildly popular in its market segment, Telnack's "Aero" look proved to be either a love or hate proposition with potential buyers of the Crown Victoria. Along with its distinctive no-grille front fascia, the Crown Victoria would share a similar roofline with the Taurus, similar body and bumper moldings, similar door handles, aircraft-style doors, and similarly shaped headlamp and taillamp clusters. To reduce aesthetic commonality with the Mercury Grand Marquis, only the front doors, windshield, and alloy wheels were shared between them. For the interior, the two vehicles also were given different seats, door trim, and dashboards; the Crown Victoria featured an instrument panel with round dials that included voltage and oil pressure gauges, while the Grand Marquis featured a horizontal speedometer without the full instrumentation. An electronic instrument panel was introduced as an option. Though better received than the 1990 redesign of the Chevrolet Caprice, the 1992 Crown Victoria was met with disapproval from some critics and buyers, leading Ford to revise the exterior. For model year 1993, a grille was added to the front fascia (though it retained its "bottom-breather" cooling system configuration); for 1994, a red reflector strip was added to the trunk lid to visually connect the taillamps. For the 1995 model year, a mid-cycle redesign saw more extensive changes to the Crown Victoria; a 6-slot grille replaced the egg-crate design, and wider taillamps were added to the rear with the license plate positioned between them on the trunk lid. Inside, the 1995 Crown Victoria had redesigned seats and a new dashboard which was now shared with the Grand Marquis. The new design featured larger controls and switches, with the radio enlarged and positioned higher. The gauge cluster retained its previous layout. In late 1995, the first-generation "brick" airbag steering wheel was replaced by one with a smaller hub that returned the horn button to the center of the wheel. As with its LTD Crown Victoria predecessor, the Crown Victoria was a six-passenger automobile; the front seat was a 50/50 split bench seat. The Crown Victoria was sold in two trim levels: base and LX, with the latter forming the majority of non-fleet sales. In addition, the Crown Victoria P71 replaced the fleet-market "S" designation in 1993; the P71 was marketed exclusively for law-enforcement sales. As with the Mercury Grand Marquis, a driver airbag was standard equipment and a passenger airbag was added as an option during later 1991 production. It later became standard in 1993 for the 1994 model year. A popular feature were the anti-lock brakes and low-speed traction control. For 1996, a single-key entry system became standard, along with a hidden audio antenna, rear window defroster and tinted glass. Automatic climate control and a JBL audio system became available on the LX. For 1992, Ford introduced the Crown Victoria Touring Sedan as a performance-oriented flagship trim. The Touring Sedan featured a number of suspension and handling improvements over the Crown Victoria LX, featuring the heavier-duty suspension components of the police-package version, and also including wider tires, rear air suspension, removal of the speed limiter, and a 210 hp dual-exhaust variant of the 4.6 L V8. Optional features included speed-sensitive steering and larger-diameter sway bars. Distinguished by its standard two-tone exterior paint scheme (with painted alloy wheels), the Touring Sedan featured a unique leather interior with every feature available on a Crown Victoria at the time. For a lower price, Ford offered the performance upgrades of the Touring Sedan on the LX as the Handling and Performance Package alongside a separate towing package. The Touring Sedan would be a one-year-only model, as it was discontinued after 1992. However, the Handling and Performance Package remained an option in various forms until 2007. The second generation of the 1998 Ford Crown Victoria commenced sales on December 26, 1997. Although the 1992-1997 Ford Crown Victoria saw better critical and marketplace acceptance than the controversial styling of the 1991 Chevrolet Caprice, its sales struggled to match those of its Mercury Grand Marquis counterpart. In an effort to gain acceptance among buyers (and increase parts commonality), for the 1998 model year, the Crown Victoria adopted much of the exterior design of the Mercury Grand Marquis. Following its 1998 introduction, the second-generation Crown Victoria underwent an extensive revision for the 2003 model year. Introduced in April 2002, while the exterior saw no change, nearly the entire chassis was redesigned, with major updates to the suspension and steering. The second-generation Ford Crown Victoria continued the use of the Ford Panther platform, shared with the Mercury Grand Marquis and Lincoln Town Car. Under the 1998 redesign, several changes were made to the rear suspension to improve general road manners (at the expense of reduced towing capacity). The original three-link coil-spring configuration was replaced with a four-link configuration with a Watt's linkage. Continuing the use of four-wheel disc brakes, for 1998, enlarged brake rotors necessitated a shift to 16-inch wheels for all Crown Victoria models. For 1999, ABS became standard on all Crown Victorias (except Police Interceptors). For the 2003 model year, the suspension and steering underwent an extensive update, paired with the chassis redesign. For the first time, the Crown Victoria adopted rack and pinion steering (replacing the long-running recirculating ball system), with the adoption of aluminum front control arms. In the rear, twin-tube shocks (in use since the mid-1960s), were replaced by monotube shocks; to improve maintenance and on-road handling, the shocks were moved outside of the frame rails. As part of the suspension upgrades, the Panther-chassis vehicles were fitted with wheels with high positive offset (flat-face). For 2006, the steel wheels of the Crown Victoria shifted to a 17-inch diameter. The second-generation is powered by a single engine, the 4.6L SOHC 16-valve Modular V8. Carried over from 1992-1997, output for 1998 was raised to 200 hp (dual-exhaust examples produced 215 hp). For 1999, spark plug wires were replaced by coil-on-plug ignition (a feature first used on the DOHC 4.6L V8). For 2001, the 4.6L V8 received new cylinder heads (from the Mustang GT), raising output to 220 hp (235 hp in dual-exhaust configuration). For 2003, the engine output was increased further, to 224 hp and 239 hp (depending on exhaust configuration); the increase resulted from a knock sensor fitted to the engine. For 2004, engine output was increased for the last time, as the Police Interceptor raised output to 250 hp (as its engine received the air intake of the Mercury Marauder). For 2005, the engine underwent a minor revision, as it adopted electronic "drive-by-wire" throttle control. From 1998 to 2004, the 4R70W 4-speed automatic was paired with the 4.6L V8, replaced by the 4R70E after 2005 (the latter designed to accommodate electronic throttle controls); the 4R75W was exclusive to the 2004 Police Interceptor. Following the poor critical and sales acceptance of the 1991-1996 Chevrolet Caprice and Buick Roadmaster, for the second-generation Crown Victoria, Ford sought a more conservative exterior design, choosing design commonality with the Mercury Grand Marquis over the Ford Taurus. In doing so, the Crown Victoria adopted the formal notchback roofline of its Mercury counterpart, sharing all four doors (previously, the front doors were shared). On the front fascia, both the grille and headlamps were enlarged. The rear fascia underwent a redesign, as large taillamp units were mounted at the corners of the body, replacing the previous full-width design. In contrast to its Mercury counterpart, the Crown Victoria was nearly devoid of chrome trim, largely restricted to the grille, window trim, and trunklid. In contrast to the exterior, relatively few changes were made to the interior, updated for the 1995 model year. Offered with nearly the same features as the Grand Marquis, the Crown Victoria was largely differentiated by its (optional) wood trim and seating materials. To comply with US federal regulations, for 2000, the Crown Victoria adopted an emergency trunk release system, alongside other safety features, including LATCH anchors and "Belt Minder" (seat belt reminder chime that sounds for an unbelted front seat occupant). For 2001, the dual airbags were redesigned, replaced by dual-stage airbags; power-adjustable pedals became an option. For 2003, seat-mounted side airbags became an option. For the 2007 model year, the optional side airbags underwent revision to better protect passengers in side-impact collisions. For the 2002 model year, heated exterior side mirrors became available, along with standard floor mats, improved cloth upholstery; for LX-trim vehicles, a trunk storage organizer became an option. In contrast to the extensive mechanical changes for the 2003 model year (and redesigns of the Mercury Grand Marquis and Lincoln Town Car), the Ford Crown Victoria saw no exterior changes since the 1998 model year (grille changes were limited to Police Interceptors). For the interior, a minor update saw redesigned front and rear seats (distinguished by taller head restraints) and redesigned door panels. During the 2003 model year (after December 2002 production), Ford began to de-content the Crown Victoria, removing the amber-color turn signal lenses, body-color sideview mirrors, front-seat map pouches, locking fuel cap, automatic-release parking brake, and engine compartment light. For 2004, in one of the first American cars to do so, the Crown Victoria adopted laminated door glass as an option; along with providing additional security, the feature filtered UV light and heat from the interior. In another revision, the overhead console was redesigned. For 2005, the Crown Victoria received a new non-locking steering column, which gave the model its first new steering wheel since 1998. For the first time, the Crown Victoria offered a moonroof as an option; in line with other Ford vehicles, a 6-disc CD changer became an option. For 2006, the dashboard of the Crown Victoria saw a revision, as Ford introduced a new instrument panel (for the first time since 1992). Along with becoming the final Ford Motor Company fitted with a tachometer in North America, the 2006 Crown Victoria became the final Ford vehicle to adopt a digital odometer (as the digital instrument panel option was discontinued); Police Interceptors were given an engine hour meter. Carried over from the 1992-1997 Crown Victoria, the second-generation Crown Victoria was marketed in two trim levels: Ford Crown Victoria and Ford Crown Victoria LX (internally designated P73 and P74, respectively). The Crown Victoria P71 was carried over, with Ford creating the Crown Victoria Police Interceptor as a stand-alone model for 1999. For 2000, Ford offered a "Special Edition" option package for the LX; along with namesake exterior badging, the interior was fitted with two-tone leather seating. For 2001, Ford offered a counterpart to the Mercury Grand Marquis LSE, named the Sport Appearance Package. Alongside the standard Handling and Performance Package, the Sport Appearance Package offered 5-passenger seating with a floor-mounted shifter, 5-spoke aluminum wheels, and monochromatic exterior trim. For 2002, the Sport Appearance Package was renamed Crown Victoria LX Sport; with the Handling and Performance Package, it was fitted with rear air suspension, a 3.27:1 rear-axle ratio, and a larger rear stabilizer bar. Sharing many of the performance upgrades of the Mercury Marauder (with the exception of the engine), the LX Sport was produced through 2006. For 2007, most features of the LX Sport returned as the Handling and Performance Package became a stand-alone option. In 2006, after factoring out fleet/Police Interceptor sales (95% of production), retail sales of the Crown Victoria dwindled to 3,000 (coming within 1,100 units of the Ford GT supercar), outsold by its Mercury Grand Marquis counterpart by an 18-to-1 margin. For 2008, Ford ended retail sale of the Crown Victoria in the United States, removing the model from its website (later replacing it with the newly revived 2008 Ford Taurus); through Ford Fleet, sales continued of the Police Interceptor and commercial (taxi/fleet/LWB) variants. Subsequently, the only retail market selling the Ford Crown Victoria was the GCC/Middle East, with the Crown Victoria sold alongside the Mercury Grand Marquis. For 2009, the Crown Victoria model line underwent a consolidation, as the LX became the sole version of the standard-wheelbase Crown Victoria (alongside the Police Interceptor). In line with its Mercury and Lincoln counterparts, 17-inch wheels became standard, with the LX adopting the 5-spoke alloy wheels of the LX Sport/Handling and Performance Package (the package itself was discontinued during the 2008 model year). To streamline manufacturing, several features were standardized, including power-adjustable pedals and side airbags. To comply with federal regulations, recessed power window switches were added (replacing a design used since 1995). The Ford Crown Victoria is the only Panther vehicle which was produced for the 2012 model year, as the Mercury Grand Marquis, Lincoln Town Car, and Ford Crown Victoria Police Interceptor were discontinued during the 2011 model year. As 2012 production was illegal for sale in the United States (due to lack of stability control), the entire 2012 production was exported to the Middle East. From the 1992 introduction of the Crown Victoria to the 2005 introduction of the Ford Five Hundred, the layout of American full-size sedans underwent an extensive transition. By 1996, as General Motors ended production of the Chevrolet Caprice, Buick Roadmaster, and Cadillac Fleetwood, virtually all competitors of the Crown Victoria had adopted front-wheel drive, with a five-passenger configuration largely replacing six-passenger seating (with the first two generations of the Toyota Avalon becoming the sole Japanese-brand sedan marketed in North America with a front bench seat). As an unintended consequence of the 1996 discontinuation of the Chevrolet Caprice, in the late 1990s, the Crown Victoria secured a near-monopoly of police car sales and significant market share of taxi vehicles; both segments viewed body-on-frame construction with rear-wheel drive as advantageous attributes. 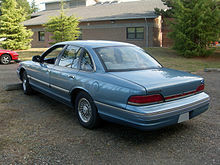 As the sole remaining competitor of Crown Victoria was its Mercury Grand Marquis counterpart, to decrease internal competition, marketing for the Crown Victoria was de-emphasized, shifting buyers interested in Ford vehicles to the Taurus; buyers seeking full-size vehicles were shifted towards the Mercury Grand Marquis and Lincoln Town Car. For 2005, Ford introduced the Five Hundred sedan, deriving its chassis components from the Volvo S80. The larger of the two cars intended to replace the Ford Taurus (alongside the Ford Fusion), the front-wheel drive Five Hundred was the first completely new full-size Ford sedan since 1979. While nearly a foot shorter than the Crown Victoria, the Five Hundred offered comparable interior dimensions; in a major shift, the Five Hundred adopted a five-passenger configuration as standard. The 2006 Ford restructuring plan The Way Forward ultimately sealed the fate of the Ford Crown Victoria. Coinciding with the 2008 withdrawal of the Crown Victoria from retail sale (see above), in 2009, Ford announced the 2011 closure of St. Thomas Assembly in Southwold, Ontario, Canada. At the time, production of the Ford Panther platform was to cease, as the architecture was unable to support electronic stability control, required for 2012 vehicles sold in the United States and Canada. 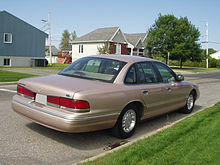 In line with the announcement, the Mercury Grand Marquis and Lincoln Town Car were discontinued without replacement (the former, as part of the closure of the Mercury brand). From August 31, 2011, St. Thomas Assembly produced a short run of 2012 model year Ford Crown Victorias; all vehicles were produced for GCC export, as they were illegal for sale in the United States and Canada. On September 15, 2011, the final Ford Crown Victoria rolled off the assembly line, destined for export to Saudi Arabia; the vehicle was the final Panther-platform vehicle produced and the final vehicle produced at St. Thomas Assembly. As with the Mercury Grand Marquis and Lincoln Town Car, the Ford Crown Victoria was discontinued with no direct successor. The Crown Victoria Police Interceptor is the only Panther-platform vehicle that was directly replaced, as Ford introduced Ford Police Interceptor sedan (based on the Taurus) and the Police Interceptor Utility (based on the Ford Explorer); both vehicles are derived from each other and are redesigned versions of the chassis introduced by the Ford Five Hundred. In 2010, a variant of the Ford Transit Connect was developed specifically for taxicab usage. While not the winner of the New York City Taxi of Tomorrow competition, the Transit Connect has been adopted for use elsewhere in the United States. Starting with the 1998 model year, the police version of the Crown Victoria, previously named Crown Victoria P71, was changed to Police Interceptor, and new rear badging was assigned instead of the civilian Crown Victoria badge. Though the Crown Victoria badge is still affixed to Police Interceptors equipped with the Street Appearance package for vehicles that require civilian styling (undercover cars, office/city motor pool, fire departments, etc. ), Police Interceptor models come with a black front grille, a black rear fascia on the trunk lid, with chrome trim under the tail lights through 1999 models and black trim under the tail lights on 2000 and later models. 1999 through 2000 models have a blacked out version of the standard chrome bar grille, while 2001 and up models have a black honeycomb type grille. They also have several "heavier-duty" mechanical upgrades, and newer models have additional safety features to deal with fuel-tank safety concerns. Ford has replaced the Crown Victoria Police Interceptor with upgraded and heavy-duty versions of the Ford Explorer and Ford Taurus. In response, many police departments like that of Austin, Texas, are buying reserve supplies of the last Crown Victorias to allow them to maintain a fleet of reliable police cars into the future. 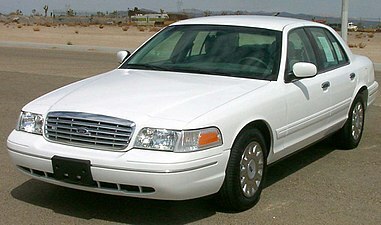 In 2002, Ford introduced a long-wheelbase version of the Crown Victoria, extended six inches to a 120.7-inch wheelbase. As with the extended-wheelbase Lincoln Town Car L, the long-wheelbase Crown Victoria was modified through the use of a longer frame and longer rear doors; all additional interior room was added to the rear seat. While not offered for retail sale in North America, the long-wheelbase Crown Victoria was offered for fleet sale, targeted directly for sales in taxi and livery markets. From 2002 to 2006, a special-service version was offered for law-enforcement sale (though not as a Police Interceptor) with street-appearance trim from 2002 to 2004. For GCC export (see below), Ford offered long-wheelbase versions of both the Crown Victoria and Mercury Grand Marquis for retail sale. Ford of Canada (the official manufacturer of the Crown Victoria, Police Interceptor, and Mercury Grand Marquis) marketed the Ford Crown Victoria in Canada through the 1999 model year. Coinciding with the withdrawal of the Mercury brand from Canada, for the 2000 model year, Ford of Canada continued sale of the Grand Marquis in Ford dealerships through the 2009 model year, replaced by the 2010 Ford Taurus. For fleets, sales of the Crown Victoria (consisting largely of the Police Interceptor) continued through the 2011 model year; as in the United States, its lack of stability control precluded further legal sale in Canada. Through its production, the Ford Crown Victoria was exported to two Gulf Cooperation Council nations (Kuwait and Saudi Arabia) alongside its Lincoln-Mercury counterparts. In a region favoring full-size sedans (among other vehicles) the Crown Victoria became popular, as buyers of the region favored its durability, reliability, and ease of use (in comparison to German and British luxury vehicles), along with its lower price. As American nameplates shifted to newer vehicles (with the introduction of the Chrysler 300C, Dodge Charger, and the Chevrolet Caprice becoming a variant of the Holden Caprice), during the 2000s, the Crown Victoria, Grand Marquis, and Lincoln Town Car, while still popular, began to lose market share, primarily due to their age. Panther-chassis sedans destined for Middle East export were referred to as "GCC-Spec" vehicles. Five versions of the Crown Victoria were available: Standard, Sport, Long-wheelbase, LX, and LX Sport. Unlike the United States and Canada, the long-wheelbase Crown Victoria was available for retail sale. In Kuwait, where the Crown Victoria was outsold by the higher-trim Mercury Grand Marquis, only the Standard and Long-wheelbase versions were sold after 2000 (the LX was discontinued in 1999). Along with the fitment of a metric instrument panel, several modifications are made to GCC-Spec Crown Victorias. In place of the 50/50 bench seat of the standard Crown Victoria, GCC-Spec vehicles use a 40/20/40 bench seat. Derived from the Lincoln Town Car, the front seat has air conditioning vents for the rear seats (except for LX Sport models), an 8-way driver's seat, a 4-way manual passenger seat (an 8-way power seat as an option); seat upholstery is either cloth or leather. On all standard-wheelbase models, a true dual-exhaust system was fitted (not available on an American Crown Victoria). On Standard and Standard Long-Wheelbase models, a driver's side spotlight assembly was optional. A DVD entertainment system (marketed as "Export DVD Entertainment System") was added for the 2007 model year; it was optional on Sport, LX and LX Sport models. Differing from its American/Canadian counterpart, the warranty offered for a GCC-spec Crown Victoria was 5 years/200,000 kilometers (125,000 miles) – whichever came first. Derived from the Mercury Marauder, a trunklid spoiler was either standard or an option on all standard-wheelbase models. For GCC-spec vehicles, the optional Handling and Performance Package (HPP) offered in the United States was rebranded the Export Handling Package (EHP). The EHP differed from the HPP largely by its retention of the 2.73:1 rear axle ratio (the standard-equipment "taller" axle) and the use of a true dual exhaust system (standard equipment on all standard-wheelbase export Crown Victorias). Included as part of the Sport and LX Sport trims (optional on the LX), the package includes tuned rear air suspension, revised coil springs, handling shock absorbers and a larger rear stabilizer bar. On GCC-Spec Crown Victorias, the EHP option is externally distinguished by a monochromatic paint scheme, with Ford offering Dark Toreador Red, Silver Birch, Tungsten, and Black as color choices. Everything else on the Special Edition package is identical to the Standard-trim model. Not listed in any sales literature, in Saudi Arabia, it was available with a choice of different colors. In Kuwait, the Special Edition was only available in black (due to market size); the price was approximately KWD 6,000 (approximately $22,000 USD). For 2009, the Special Edition was withdrawn. The reports that the cars were more prone to fires during a rear collision were a simple combination of three things. First, most law enforcement agencies relied heavily on the Crown Victoria as their primary vehicle, meaning that any police-related auto accident was very likely to involve a Crown Victoria. Second, the accidents occurred as the result of the officers intentionally parking their vehicles close to active traffic to shield a stopped motorist—something most civilians would never do. Third, the impacting vehicle was often traveling at, or above, the posted legal limit (65 to 75 mph (105 to 121 km/h) in most jurisdictions). The condition was exacerbated by police equipment installers drilling over the package tray in the luggage compartment. Due to the gas tank's orientation, drilling through the package tray may result in drilling into the gas tank. Installers also used screws set directly into the bulkhead and facing the fuel tank. In the event of a high-energy collision, these screws could be forced into the tank, both rupturing the tank and possibly acting as a spark source. Long bolts for mounting heavier equipment were also directly suspect. The manufacturer provided an aftermarket shield to help prevent these items from puncturing the tank during impact. Further, many investigations, both performed by federal/state agencies, and the police department themselves, have found that removable items in the trunk were improperly stowed. These items became tank-piercing projectiles during the rear-collision scenarios. Ford's second solution came in the form of a recall kit including patterns to mark unsafe areas (to drill) in the luggage compartment. Also included were rubberized kevlar and hard ballistic nylon shields for the differential cover lower shock bolts. They also included a kevlar-based trunk liner. Ford used similar kits on early-1980s model passenger vehicles. For 2005 and newer models, Ford offers an optional on-board fire-suppression system for the Crown Victoria Police Interceptor units. The system itself is integrated with the anti-lock braking system as part of the activation, and can be activated manually. However, Ford does cite several system limitations regarding fuel loss and impact speeds. Notably, only the Ford Crown Victoria and new Ford police car have been certified for high speed rear impact collisions, adding credibility to Ford's statement that fiery crashes are a result of extreme and unfortunate situations. Model years 1996 to 2001 inclusive, using an all-composite intake manifold, are subject to coolant leaks. Late in 2005 Ford settled a class action lawsuit. See Intake Manifold Defect for details. This problem can be remedied by upgrading the intake manifold to the 2002 and up version. ^ a b Anderson, Jim (August 30, 2011). "As Crown Vic bows out, police ponder new options". Ottawa Citizen. McClatcy-Tribune News. Archived from the original on November 10, 2011. Retrieved June 19, 2015. ^ Orlove, Raphael (15 November 2017). "Why Police Departments And Taxi Drivers Loved The Ford Crown Vic". Jalopnik. Retrieved 5 March 2018. ^ Consumer Guide, ed. (1995). How to Buy a Used Car. Penguin Group. p. 100. ISBN 9780451183446. Retrieved 5 March 2018. ^ Sweet, Sam (3 September 2013). "The Crown Vic Jumps Its Last Curb". The New Yorker. ISSN 0028-792X. Retrieved 5 March 2018. ^ "1955 Ford brochure". Oldcarbrochures.com. Retrieved 2012-01-06. ^ "1956 Ford Fairlane Victoria brochure". Oldcarbrochures.com. Retrieved 2012-01-06. ^ a b c d Ford Crown Victoria - Everything You Need to Know - Up to Speed (YouTube). Donut Media. June 7, 2018. Retrieved July 12, 2018. ^ "1992 Ford Crown Victoria (since early-year 1991 for North America U.S.) specs review". Automobile-catalog.com. Retrieved June 19, 2015. ^ "1992 Ford Crown Victoria Touring Sedan (since early-year 1991 for North America U.S.) specs review". Automobile-catalog.com. Retrieved June 19, 2015. ^ H. Kent Bowen; Charles A. Holloway; Professor H Kent Bowen; Kim B. Clark, eds. (1994). The Perpetual Enterprise Machine: Seven Keys to Corporate Renewal Through Successful Product and Process Development. Oxford University Press. pp. 12–. ISBN 978-0-19-508052-0. ^ a b Schuon, Marshall (1992-05-31). "About Cars; Ford Caps Its Line of Crown Victorias". The New York Times. ^ "Ford unveils 'import' Mercury Grand Marquis for 1992". UPI. ^ "First two cars roll off $77-million Ford line". Ottawa Citizen. p. 86. ^ Standish, Frederick (12 May 1991). "So what's an import car? Here's the fuelish answer". The Bulletin. p. C-5. ^ Titus, Rick (April 1991). "Ford Revitalizes Big Car Lineup". Popular Mechanics. 168 (4): 127. Retrieved June 19, 2015. ^ "1997 Ford Crown Victoria Overview". MSN. Archived from the original on July 28, 2009. Retrieved 2008-09-21. ^ "Crown Victoria earns top ranking". The Daily Courier. 27 March 1994. p. 10C. ^ "1996 Ford Crown Victoria Overview". MSN. Archived from the original on May 15, 2009. Retrieved 2008-09-21. ^ "2000 Opens Solidly". www.adandp.media. ^ "2005 Ford Crown Victoria Overview". AOL. Archived from the original on February 10, 2009. Retrieved 2008-09-21. ^ a b c d e "Year-to-Year Changes". 2010-01-03. Archived from the original on 2010-01-03. Retrieved 2018-04-16. ^ "2001 Ford Crown Victoria Overview". MSN. Archived from the original on May 13, 2009. Retrieved 2008-09-21. ^ "2000 Ford Crown Victoria Overview". MSN. Archived from the original on April 26, 2006. Retrieved 2008-09-21. ^ "Ford Crown Victoria 2007-08 models mfg. after July 2006". Iihs.org. 2008-11-25. Archived from the original on November 7, 2010. Retrieved 2011-01-04. ^ "2002 Ford Crown Victoria Overview". MSN. Archived from the original on May 13, 2009. Retrieved 2008-09-21. ^ a b "2004 Ford Crown Victoria Overview". AOL. Archived from the original on January 14, 2009. Retrieved 2008-09-21. ^ "2004 Ford Crown Victoria Overview". MSN. Archived from the original on May 13, 2009. Retrieved 2008-09-21. ^ "2005 Ford Crown Victoria Overview". MSN. Archived from the original on May 13, 2009. Retrieved 2008-09-21. ^ a b c d "Crown Victoria - P7x Breakdown". 2008-11-19. Archived from the original on 2008-11-19. Retrieved 2018-04-16. ^ a b Webster, Sarah A. (2007-10-31). "Way Forward doesn't include Crown Vic: Dealers will no longer sell the Ford Crown Victoria". Detroit Free Press. Archived from the original on December 20, 2008. Retrieved 2008-08-16. ^ "Ford Crown Victoria RIP". The Truth About Cars. Retrieved 2011-01-04. ^ Michael M. Grynbaum (2010-06-25). "Two Car Models, New York Emblems, Discontinued". New York Times. Retrieved 2011-06-04. ^ "Ford Announces Development Of All-New Police Interceptor For Law Enforcement Use Nationwide" (Press release). Media.ford.com. 2009-11-13. Archived from the original on May 19, 2011. Retrieved 2011-01-04. ^ "Austin police ask for $4.5 million to stock up on Crown Victorias". Statesman.com. Archived from the original on 2011-04-21. Retrieved 2011-04-24. ^ Lai, Eric (2007-04-07). "Why sell Crown Vic only to fleets up here?". Toronto Star. Archived from the original on 2008-12-20. Retrieved 2008-08-16. ^ Kiley, David (2002-04-10). "Police car fires not Crown Vic's fault". USA Today. Retrieved 2008-08-26. ^ "Ford Fleet - Showroom - Police Vehicles - Fire Suppression". Fleet.ford.com. 2005-02-02. Retrieved 2011-01-04. ^ a b "Ford Division reports monthly sales" (Press release). PR Newswire. 5 January 1995. Archived from the original on November 6, 2012. ^ a b "Ford Sets Truck Sales Records; Leadership Streaks Extended" (Press release). PR Newswire. 6 January 1997. Archived from the original on November 6, 2012. ^ a b "Ford Reports Detailed Sales Results" (Press release). Theautochannel.com. 1999-01-06. Retrieved 2011-05-20. ^ a b "Ford Motor Company Sets New Full Year U.S. Sales Record" (Press release). Theautochannel.com. 2001-01-03. Retrieved 2011-05-20. ^ a b "Ford Motor Company's December U.S. Sales Climb 8.2 Percent" (PDF) (Press release). 2003-01-03. Archived from the original (PDF) on April 30, 2011. Retrieved 2011-05-20. ^ a b "Ford's F-Series Sets Industry Truck Sales Records; America's Best-Selling Vehicle 23 Years in a Row" (PDF) (Press release). January 4, 2005. Archived from the original (PDF) on May 25, 2011. ^ a b "Ford Motor Company Reports December 2006 and Full Year 2006 U.S. Sales" (PDF) (Press release). January 3, 2007. Archived from the original (PDF) on October 7, 2012. ^ a b "F-Series drives ford to higher market share for third consecutive month" (PDF) (Press release). Ford Motor Company. January 5, 2009. Archived from the original (PDF) on February 6, 2009. Retrieved 2009-05-14. ^ a b "Ford's 2010 Sales Up 19 Percent - Largest Increase of Any Full-Line Automaker; Foundation Set for Growth in 2011" (PDF) (Press release). Media.ford.com. 2011-01-04. Archived from the original (PDF) on January 24, 2011. Retrieved 2011-05-20. ^ "2011 Ford Brand Sales up 17 Percent for the Year in U.S." (PDF) (Press release). Media.ford.com. 2012-01-04. Archived from the original (PDF) on January 31, 2012. Retrieved 2012-01-04. ^ "Ford Cars, Utilities and Trucks All Post U.S. Sales Gains in 2012" (PDF) (Press release). Media.ford.com. 2013-01-03. Archived from the original (PDF) on January 23, 2013. Retrieved 2013-01-03. Wikimedia Commons has media related to Ford Crown Victoria. This page was last edited on 11 April 2019, at 11:04 (UTC).